Is it cloudy or is it pollution? 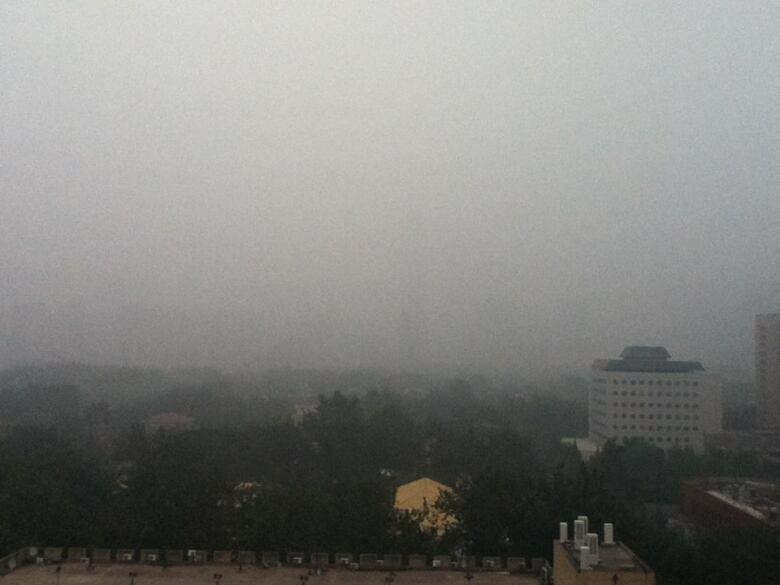 The CBC's Andrew Lee examines the perils of pollution in China. Mercury from Asia contributes 20 to 30 per cent of the poison deposited in U.S.
Perhaps the best explanation I have heard about China’s air problem is from Karl Pilkington, famous as the blunt-talking star of the Sky Television series Idiot Abroad. Pilkington had just landed — and looking outside, asks the camera operator following him, “Is it cloudy or is it pollution... it's not worth having in HD is it? Nothing looks crisp. Everything is sort of hazy.... like some sort of Kate Bush video or something." I ran into another bitter Brit in Tiananmen Square, who had a very expensive Nikon with even more expensive lenses. He was fuming that he couldn’t take a clear picture. Every picture was hazy. He said all the megapixels and pricey glass won’t fix that. I tried to explain to him the best photos were of the pollution but that didn’t sit well with him as he wanted to take photos like the brochures of China’s amazing monuments — images, which are almost always retouched, with a clear blue sky as a background. Stories like this aren’t news to Dan Jaffe, ­­­­ a professor of atmospheric and environmental chemistry at the University of Washington. He follows air in Asia closely. More precisely, he follows it as it travels around the world and comes to North America. “We know this pollution impacts all the way from Alaska down to Southern California," said Jaffe. "It takes five to eight days for air that is over China to arrive in the United States [depending on the wind]. From a mountain-top facility on Mount Bachelor in Oregon, they have been analyzing what the wind brings them. “We've documented long-range transportation of pollutants to North America. What we know is that mercury from Asia contributes 20 to 30 per cent of the mercury that is deposited here in the United States." He goes on to list an array of other toxic chemicals, “carbon monoxide, carbon dioxide, nitrogen oxide, sulfur. A whole witches' brew of pollutants, including ozone, gets moved across." Jaffe knows what many people do not — the smog that makes headlines in Beijing or Shanghai does not stop at the edge of those mega cities. Giant swathes of China, both rural and urban, are regularly cloaked in air pollution. I once travelled 1,200 kilometres from Beijing to Shanghai by rail and never left dense smog. People in China longingly speak of “blue sky days." When people show their vacation pictures from abroad they show pictures of the sky and people marvel about the clarity of the air. I asked a woman in a Beijing park about the air on a typical day last week and she responded, “It's bad, can it be good?” Her friend argued: "Today is OK. It’s cloudy but not hazardous [the worst air quality level]." Xingtai is a coal-mining hub and has a massive coal-fired electrical plant. It only had 38 days when the air met Chinese national standards in 2013. China hungrily consumes coal, and since 2003, it has doubled its coal use. Mercury is released into the air when coal is burned. Xia Yishan is with the China Energy Strategy Research Centre at China’s Institute of International Studies and is an expert on energy. “Our country's coal production is number one in the world, the percentage of coal energy consumption is also number one.” China is also the No. 1 producer of greenhouse gases as well. While there is some talk that China’s coal consumption has peaked, Xia Yishan says it may still increase a little then stabilize. Currently, China burns about as much coal as the rest of the world combined. Xia says that China has started to burn coal more efficiently in some cases. Dan Jaffe has noticed less sulfur in his measurements of what comes over the Pacific. Yet, he says that is one of the easier pollutants to clean. Others are more challenging. Jaffe ended our interview with a stark warning about what may come. Even if China caps its coal consumption, other countries are lining up to burn more coal. It is predicted that India’s production of coal-fired electricity will triple by 2020 and Asia’s use of coal-fired energy will increase by 50 per cent (Source: Coal-fired Boilers: World Analysis and Forecast published by the McIlvaine Company. 2013). Xia Yishan knows “the pollution issue is without borders."